As I begin my profiles and rankings for the running back Class of 2019, I reflect on 38 years watching football. Experience is a great teacher and allows us to foresse into the future. When I became a football diehard, running backs stood atop the NFL landscape. My middle-school friends and I would debate Walter Payton, Earl Campbell and Tony Dorsett. All three stars ran with a different style and defined their teams’ offensive scheme. I will never forget the punishing violence and grit of Campbell, the utter determination and splendor of Payton or the incredible speed and grace of Dorsett. I also observed a generation of elite Heisman running backs: George Rogers, Marcus Allen, Herschel Walker, Bo Jackson and Barry Sanders. Saturday afternoons were magical while I watched these elite athletes dominate the gridiron and could not wait to see them play on Sundays. The late Seventies and early Eighties were a great time to be alive as a football fanatic. By the Nineties, I had advanced to a certifiable Draftnik. I purchased Joel Buchbaum’s and Mel Kiper’s draft guides every year from 1990 to 2004. There was nothing better than reading their breakdowns of all the prospects and getting ready for the upcoming NFL Draft as well as my fantasy leagues. Six years ago, I took the giant leap to publish my own scouting reports and am forever grateful to have the opportunity. It is the preeminent pastime for so many fanatics like myself. The industry has grown beyond my expectations thirty years ago, and there are so many great analysts providing information. It is a pleasure to be a member of such a prominent faction. While a draft buff cannot ignore rushing and receiving yards, there are other statistics that provide enhanced insight into a player’s professional potential: Yards per Carry, Receptions, Team Total Yards percentage and Combine scores (40-yard dash, 3-cone drill and 20-yard shuttle) are crucial indicators to examine a prospect. In fantasy leagues, owners have had a plethorea of elite rookie runners to choose from recently: Todd Gurley, Melvin Gordon, Ezekiel Elliot, Christian McCaffrey, Leonard Fournette and Saquon Barkley, who all immediately impacted fantasy rosters as rookies. Unfortunately, the Class of 2019 does not offer a transcendent talent like recent years. Do not be distraught. There is aptitude among this crop of ball carriers…astute NFL franchises will uncover the player and develop the talent at the next level. Listed below are profiles on the top ball carriers as well as their benchmark stats to assist in pinpointing runners at the next level. It has been an unconventional voyage from backup at Happy Valley to top running back prospect in the nation. Posted best speed (40-yard dash) and agility scores (3-cone drill and 20-yard shuttle) among runners in pre-draft process over the past month. Declared early for Draft after one season as starter. 2018 All-Big Ten Second Team, and Penn State’s Most Valuable Offensive Player. Finished second in Conference—and fifteenth in FBS—with 1,223 rushing yards. Became the sixteenth player in school history to surpass 1,000 yards on the ground. Logged over 200 yards rushing versus Illinois and eclipsed the century mark four times. In high school, a five-star prospect and consensus No. 1 player in Pennsylvania. Remained second on the depth chart for two seasons behind Saquon Barkley. At 5-foot-10 and 211 pounds, a north-south runner. Determined ball carrier who fights off defenders. Evades initial tacklers. Plants foot and accelerates up the field. Very good vision. Explodes through seams: Bounces off tacklers and spins free. Finishes runs with a “pop” and falls forward for additional yards. Runs with good pad level and low center of gravity. Silky smooth hips and sinks low through contact. Willing to lower shoulder. Works inside zone runs well and very good second-level vision. Employs a nasty stutter step. Catches ball away from body and darts upfield rapidly. Not as powerful as size indicates and gets dragged down to easily. Does not always make good decisions. High fumble rate and must learn to hold onto the football. Makes catch but needs to transition into a runner more quickly. An explosive ball carrier and will likely be the first runner selected in the Draft. In the scouting community, a film versus production/metrics debate. Astute analysits, however, take an holistic approach before making a conclusion. Played in a three-man rotation with Damien Harris and Najee Harris at Alabama. MVP of 2018 SEC Championship Game. Overlooked 3-star prospect in high school: A Wildcat quarterback and basketball player. Coach Saban learned of the Tulsa star late in the recruiting process and extended a last-minute official visit to campus. Explosive playmaker with a sturdy frame at 5-foot-10 and 220 pounds. Runs with passion and power. Exceptional balance, and possibly, best trait among skill set. Physical runner who initiates contact. Presses line of scrimmage and engages tacklers. Does not waste time or movement. Finishes runs with shoulder. Runs well between the tackles. Outstanding vision. A one-cut runner. Fluid ball carrier who can bounce runs outside. Great tackle-breaking ability. Explodes upfield when the crease opens. Churns legs through contact. Sporadically, employs vicious stiff arm. “Flash” plays throughout the season. Three-down competitor. Superb short-field acceleration. Underutilized pass catcher with capable and soft hands. Good route runner who gains separation. Tracks and adjusts to ball in air and can catch over shoulders. Dangerous catching ball in space. Good pass blocker: Squares up and willingly engages opponents. Tremendous lead blocker. Terrific teammate and high character young man. Played special teams and never complained about role in the Crimson Tide offense. Reaches top speed rapidly. A very high-ceiling prospect. Limited mileage entering NFL: Only 299 touches from the line of scrimmage. Skills foreshadow a long professional career as the foundation of a team’s running game. Impressive Iowa State product combines power and elusiveness to exasperate opponents. 2017 All-Big 12 First Team and 2018 All-Big 12 Second Team. Back-to-back 1,100-yard campaigns. Incredible 2017 crusade: PFF recorded 86 missed tackles, 3.43 yards after contact and 109 broken tackles. At 5-foot-10 and 212 pounds, a shifty and agile ball carrier. Elusive runner with astonishing contact balance. Arm-breaking and ankle-turning lateral ability. Regularly breaks tackles. Runs with low center of gravity. Physical runner who lowers head and shoulders to gain leverage. Quick and strong feet. Great stability when engaged by a defender: Stays upright on feet when hit. Limits target zone and does not take big hits. Very good initial jump cut. Keeps legs churning after contact. Good vision: Presses hole at point of attack and finds cut back lanes. Physical grinder who churns out extra yards. Played behind a lackluster offensive line. Excels with volume and heavy workload. Over the past two seasons, averaged 5.19 ypc. on 110 carries in 4th quarter and earned seven carries and scored five touchdowns on 3rd & goal situations. Attacks defenders. Fights through traffic and explodes into the second level of the defense. Employs stiff arms and spin moves to shake tacklers. Sturdy pass blocker: Sets hips low and uncoils versus blitzers. Versatile three-down back. A much better pass catcher than casual diehards might be aware. Limited burst and might not prosper in a zone blocking run game. Fits best in a gap- or power-rushing scheme. If a coaching staff commits to the former Cyclone, a perennial 1,000-yard rusher is a reasonable professional projection. Tantalizing Tiger wins in space and hits home runs at an astonishingly high rate. 2018 All-American First Team, Doak Walker semifinalist, Walter Camp Player of the Year semifinalist and All-AAC First Team. 2017 All-AAC Second Team. Finished Tigers career second all-time with 3,545 rushing yards and yards from scrimmage with 4,303. Third on school leaderboard with 36 touchdowns. Recorded back-to-back 1,000-yard seasons (1,154 and 1,909). Concluded 2018 campaign second in FBS in rushing yards and rushing touchdowns (22). In 2018, 33% of touches eclipsed eight yards and 12% exceeded 20 yards, including 16 touchdowns. During career, averaged a monstrous 8.2 ypc. on 431 carries, posted over 100 yards rushing in 16 games and eclipsed 200 yards on the ground in three contests. At 5-foot-9 and 208 pounds, stout athlete with low center of gravity. A home run hitter who can score from any distance. Hits long speed very quickly. Incredible elusiveness. Subtle and effective jump cuts. Presses frontside of play and waits patiently to make cutback into hole. Prodigious peripheral vision: Bounces plays outside. Excellent stretch runner who sees daylight on the edge and jets into space. Stupendous lateral quickness and stop-and-start capability. Marvelous contact balance and anticipatory skills. Uses hands well to fight off tacklers. Underrated between-the-tackles runner: Weaves through traffic. Identifies opponents and lowers pad level. Twists and springs around opponents. A slippery runner who glides and wiggles. Great football speed: Never gets caught from behind on film. Fluidly changes direction at top speed. Can be employed as a zone or gap runner. Not a full-time ball carrier and would excel as a lead runner in a two-man rotation. Below average pass protection and must improve to see more playing time. Inconsistent pass catcher. An underrated talent who would shine in a system that schemes one-on-one matchups on the edge and utilizes speed in space. Another prospect from the Alabama industrial complex since 2010: Mark Ingram, Trent Richardson, Eddie Lacy, T.J. Yeldon and Derrick Henry. Finished campus tenure as eighth all-time leading rusher with 3,013 yards. In 2016 and 2017, posted back-to-back 1,000-yard seasons and averaged over seven yards per carry on 285 totes. Owns school record for longest touchdown run (73 yards). A 5-foot-10 and 216-pounder who runs with rage and resolve. Short-choppy strider who patiently presses point of attack and allows blocks to unfold. Uses vision to find holes: Identifies cut back lanes and blasts through opening. Smooth lateral burst and stays balanced. Low center of gravity with quick feet. Patient and sets up blocks. Drops pads in tight quarters: Very good in short yardage and between the tackles. Authoritative ball carrier who attacks opponents. Great cutback ability. Does not go down upon first contact. Powerful runner who falls forward. Decisive competitor with natural feel for blocks. Wears down opponents. Excellent picking up pass rushers. Scheme versatile playmaker who is a three-down back. Adjusts to the ball in the air as a pass catcher. Does not have elite burst and lacks long speed. Rarely makes defenders miss in the open field and not particularly elusive. Elevated stats playing behind a great offensive line in a terrific run scheme. Best employed in a gap and/or power running attack. A very good prospect with a limited ceiling as a professional but high floor. Coaching staffs will salivate having Harris on their team. 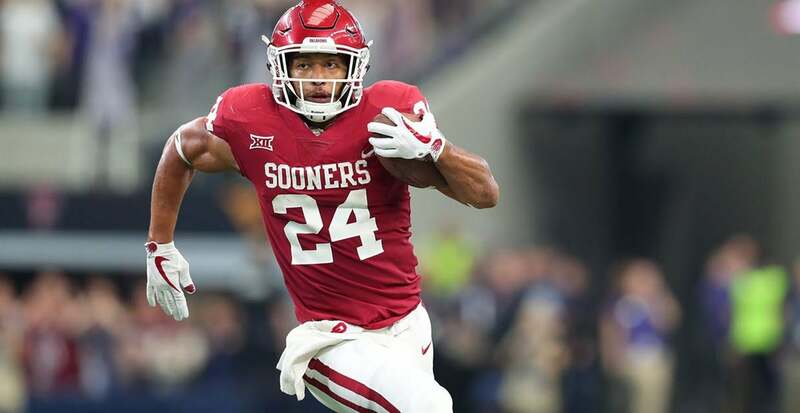 Spectacular Sooner might be the best pure runner in the Draft. 2017 All-Big 12 Second Team and 2018 Academic All-Big 12 Second Team. Graduated Oklahoma with Arts and Sciences planned program degree. Stupendous campaign two years ago: Rushed for 1,161 yards on 188 carries and scored 13 touchdowns. Also, snatched 17 passes for 281 yards and five touchdowns. Only suited up for five quarters in 2018. Four-star recruit coming out of high school. Injury-marred career at Oklahoma. Three seasons lost to injury: 2015, endured season-ending broken leg in August, 2016, suffered fractured vertebra in the neck and 2018, ACL tear versus UCLA ended campaign. A 6-foot-0 and 224-pound redshirt junior with a stout upper body and dense legs. Silky smooth runner. Great vision and quickness. One-cut ball carrier with burst. Runs with good pad level and powers through defenders. Presses gaps and sets up blocks to spring into open field. Gets skinny in the hole. Loose hips, above average foot speed and deft lateral cuts. Very good contact balance: Extends play after first hit. Good in space: Weaves around tacklers and twists and spins into open space. Moves the pile in short yardage. Versatile ball carrier featured in many different running schemes. Home run hitter. Electric pass catcher with natural and soft hands: Tracks ball well and adjusts to passes in the air. Good route runner and attacks secondary down the field. Passive pass blocker who gets punched by rushers: Must improve or will remain on sideline. Needs to improve patience and identifying holes. A prospect with skills for gap or inside zone scheme. Might not be on a few team’s draft boards because of injury background. Best suited for a role in a dual-backfield. Wide range of professional outcomes which depends on health.